Reconstruction of both lanes in the west direction near Parks, AZ was started on the I40 highway. Closed exit 171 (Pittman Valley Rd) and exit 167 (Garland Prairie) in both directions affects the travelers on Route 66 who have to use part of the I40 motorway in this area. 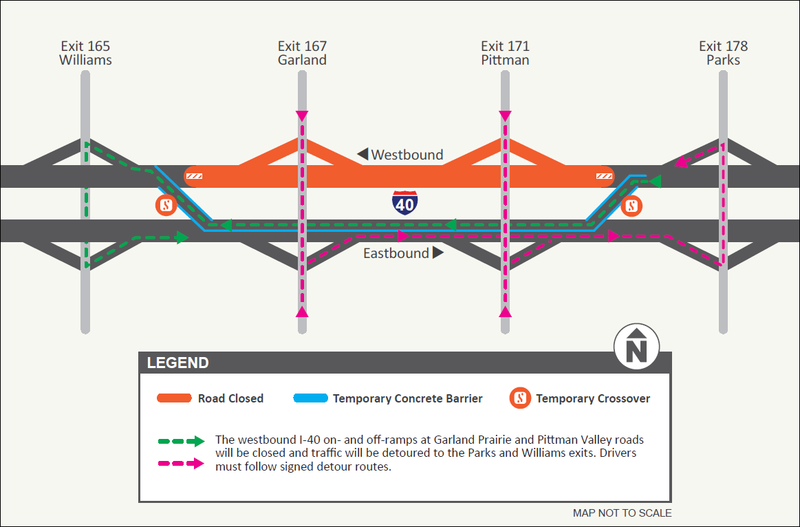 Work will occur on westbound I-40 between Garland Prairie and Pittman Valley roads first, then move to eastbound I-40 in the same area in early summer. Construction will pause for the winter season and is scheduled to resume in spring 2019 for additional paving, bridge and intersection work. Reconstruction is planned in several phases until the end of 2019. Turn to Bellemont from the I40 and continue on the parallel old Route 66 (Brannigan Park Rd). WARNING! We recommend ride this road section only in good weather conditions, roughly halfway through the stretch, the road turns to unpaved. Enjoy a ride through the dense pine forest, visit Pines General Deli & Cafe in Parks and turn back to exit 178, then use highway I40 to Williams. When driving in the east direction, both exits, 167 and 171, will be completely closed too. Route 66 Navigation app is already updated and we will navigate Route 66 passengers during the closure on the I40 only when using ROUTE A. ROUTE B will navigate via Brannigan Park Rd to exit 178. We support local business on Route 66 – for all travelers on Route 66 we updated maps with small loop to don’t miss Parks In the Pines General Store Deli & Cafe westbound as well as eastbound direction.